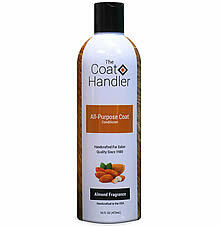 All-Purpose Coat Conditioner is small batch crafted for use on all breeds and coats by revitalizing hair and skin from the inside out. Remoisturizes, releases undercoat, loosens tangles and helps eliminate static. Can be used as a leave-in or rinse-out conditioner. Precisely concentrated 15 to 1 and finished with an Almond fragrance. 16 ounce bottle. Coconut/Palm Conditioner, Panthenol, Benzoin Tree Gum Preservative, Water, Color, Almond Fragrance.